Obama, Kerry and their willing central European co-warmongers still claim there are moderate Syrian rebels. Then they display either total ignorance or naivety by further claiming that these hardly identifiable moderates deserve to get (more) American weapons because they are supposed to do the ground fighting against the „Islamic State“. The more interesting then that these rebels already are announcing openly that they are signing truces („non-aggression“ pacts) with IS in order to focus on their common agenda: „the Nussayri regime“ (Nussayri is a perjorative term for the Syrian Alawites. Calling the government „Nussayri“ not only proves the sectarianism of the rebels including the „moderates“ but also shows that they ignore that major parts of the government and the armed forces are in fact Sunnis). Once again it is proven that alleged moderates (like the Syrian Revolutionary Front) closely work with the Al-Nusra Front, while the latter openly cooperates with IS on several fronts, e.g. Lebanon. What is Obamas (true) problem with Syria? Sure, Syria under the Assads was no paradise of human rights, but which other arab country in that region is better? At least Syria is a secular government. Sunni, Alawi, Druze, Christians, women and men, all can and are pilots, teachers, doctors, Generals, foot soldiers, ministers. Can you say that about Saudi Arabia? Plus, Syria kept a 40 year peace with Israel until today and has not attacked any country. So, what the hell is the problem the Nato countries have with Syria? Did Assad torture their people? If the „lack of legitimacy“ is an issue, what about Qatar? Has anyone there elected the ruler democratically? If they say it is nepotism and family rulership, what about Kuwait? Is it not the same family ruling there for decades? If it is the suppression of human rights and freedom of press, what about Bahrain? There a minority not only rules but also sidelines the majority totally, visible through the fact that Shia are absent from ministerial posts, the army and the security services. Instead the monarchy naturalizes Pakistani, Jordanian and other Sunnis to tip the demographic situation to the disadvantage of the indigenous Shia. Despite having not a fraction of the petrodollars of the Gulf States Syria hosted hundreds of thousands of mostly Sunni Palestinian refugees for decades. How many Palestinian refugees live in Qatar and Saudi Arabia? As usual Obama, Kerry and co. ignore or play down such embarrassing facts when they openly speak about funding and facilitating (through Saudi Arabia) the further arming of the FSA. Of course, you won´t hear western press and even less western politicians admit these acts of terror, let alone condemn them. An important secondary insight of the terror revelations by Israeli sources themselves is that the Iranians were damn right when they were accusing Israel of terrorism for years. All the time their allegations were brushed off as either conspiracy theory or „propaganda“. Attacking Syria is not an act of self-defense. Syria has not attacked the United States. Nor is Syria a danger to the US. Syria has not attacked Israel and has not even responded to numerous Israeli bombings of its soil. In addition the US attacking Syria would also not amount to defending „democracy“ for the syrian army is not fighting against any democratic state or entity. What we know is that an attack with poisonous gas killed around 350 people in the early hours of August, 21st. The much quoted „Syrian Observatory for Human Rights“ and the „Doctors without borders“ both spoke of 350 dead. There is a gap of 1100 dead to the approximately 1450 victims John Kerry mentioned. While the US says that an attack on Syria would only be limited and directed against military targets earlier cases of so called „surgical strikes“ or „precision attacks“ have managed to hit civilians with alarming regularity. The prospect of incoming Tomahawks and cruise missiles has led many Syrians to flee their houses in panic and head towards neighbouring countries. Any decision that transforms thousands of ordinary civilians to fugitives forcing them to live in uncertainty regarding their houses, their abandoned belongings, their jobs, their childrens school…is highly irreponsible and all but a necessary „humanitarian intervention“. So far the US government has talked a lot about solid evidence but brought forward none. After days of building up tension and expectations by announcing the upcoming presentation of clear proof against the syrian government, a 4pages PDF file supposed to be full of damning facts contained nothing but a mess of assumptions and platitudes. Kerrys „evidence“ was actually a confession of failure, the evidence of no evidence. Based on such (non-)facts and „evidence“ no US court would convict the defendant. – A further strengthening of the syrian-iraqi Al-Qaida branch „Islamic State of Iraq and Syria“ by weakening Assad would pose an increased threat to the already fragile Iraqi state. The conflict could spill pver even more to Iraq and Lebanon. After many years of relative calm there are almost weekly bombings and skirmishes leaving hundreds of dead every month. In Iraq the AQI (Al Qaeda in Iraq) who backs the syrian rebels has intensified (suicide) bombings of market places, mosques, Cafes and even funerals killing more than 1000 people, most of them Shia muslims. The american congress should vote against an attack on Syria. The attack would only bring further suffering to the syrian people and strengthen and embolden forces our media and politicians would call terrorists if they were fighting the US or Israel. Polls taken in France, UK and US show that the broad majority of these Nato countries populations are vehemently opposed to military intervening in Syria. A similarly high level of opposition is also expressed towards the idea of further arming the increasingly radicalized and sectarian syrian rebels. The sight of often non-syrian Salafi jihadists beheading christian Pastors as well as syrian Alawites but also the video clip showing a leader of an allegedly moderate syrian rebel faction cannibalizing the body of a dead syrian soldier will hardly have changed public opinion in favor of the rebels. 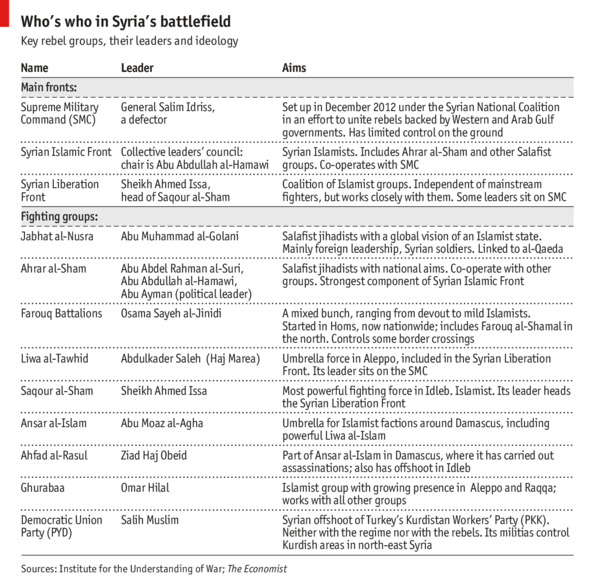 So, why are the Camerons, Hagues, Hollandes,…and probably also Obamas so keen on attacking Syria? Why don´t they care for their people´s will? Is not a democracy about representing and fulfilling the people´s will?